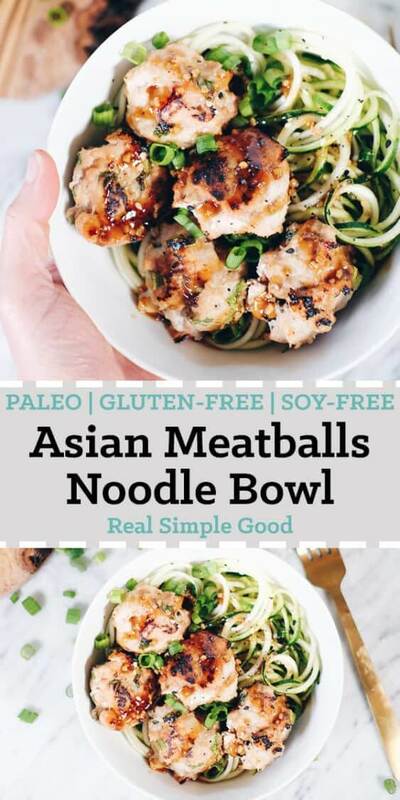 Bowls and meatballs are pretty much always a good idea, so we created this Paleo Asian meatballs noodle bowl recipe. 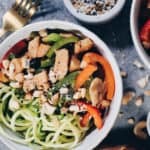 You will love this simple and clean combo for an easy dinner or meal prep lunches. These balls are easy to throw together, with just a few simple ingredients. You mix everything up in a large mixing bowl with your hands and then form the mixture into meatballs. We like to bake ours in the oven because it’s pretty quick and fuss free. So, once the meatballs are formed and lined up on a baking sheet, just transfer to the oven to bake. A tip for forming the meatballs because ground turkey is sooo sticky – use an ice cream scoop to form the meatballs. I wash my hands after everything is all mixed up, and then I use our ice cream scoop and just drop the balls right onto a parchment lined baking sheet. You start this recipe by making the sauce because it pulls double duty. 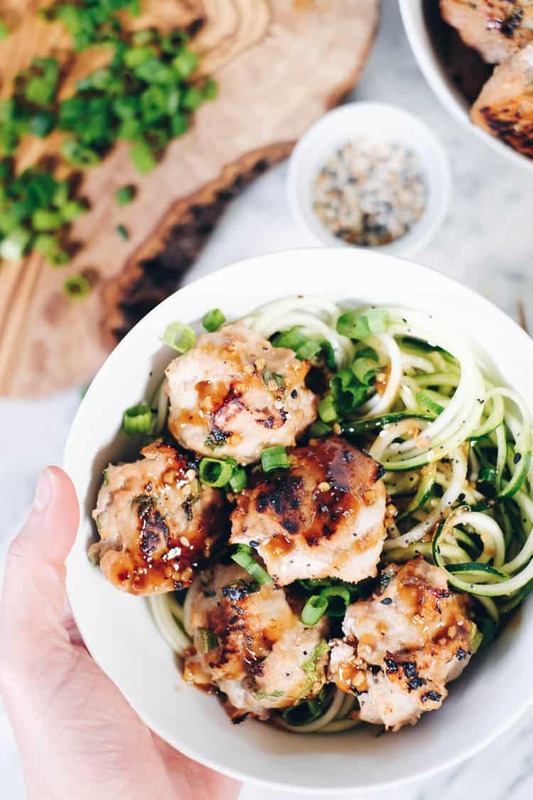 Half will get mixed into the meatballs to give them more flavor, and then the other half will get heated up and combined with arrowroot starch to make a thicker sauce for topping your Paleo Asian meatballs noodle bowl. The arrowroot starch thickens the sauce, but if you don’t have any you could also use tapioca starch or cassava flour to get ‘er done. 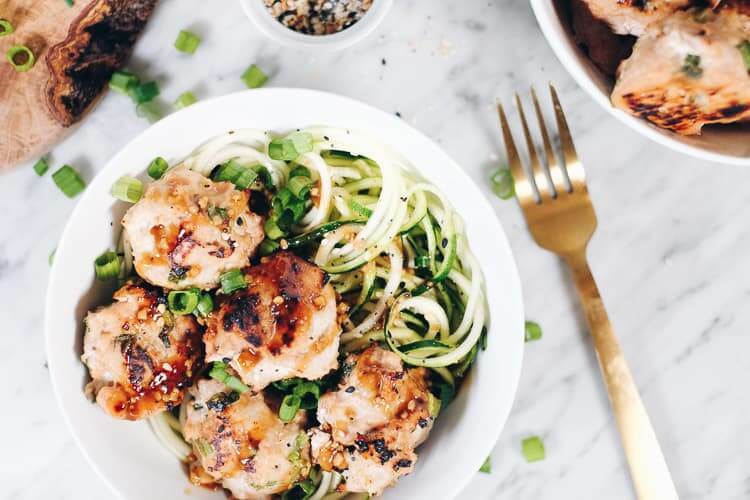 Something about zucchini I tell you – I can stand to eat WAY more of it in noodle form. Don’t you agree? Regardless, we love how spiralizing zucchini makes adding vegetables to a dish so dang easy. 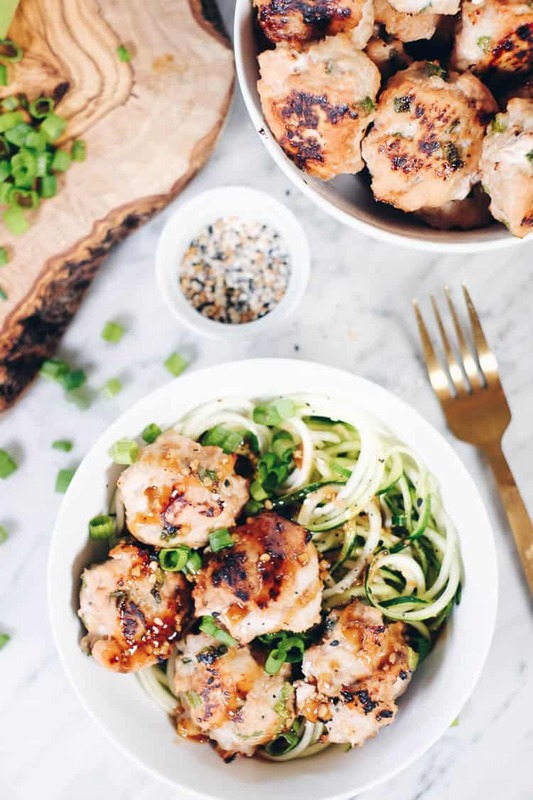 Zoodles are the perfect companion for these Paleo Asian meatballs. 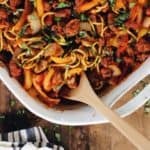 They add some green and are great for tossing in a bowl and adding protein right on top! 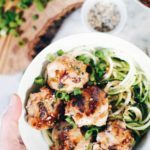 Love meatballs and zoodles? 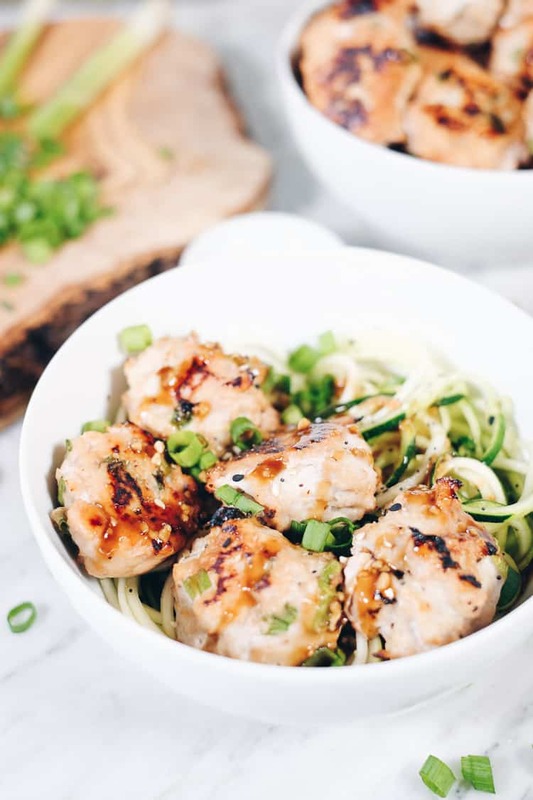 This Paleo Asian meatballs noodle bowl was made for you! Give it a try, and let us know how it goes by leaving a comment below. Also, take a photo and tag us on Instagram @realsimplegood, so we can check it out! Place all of the sauce ingredients, except for the tapioca starch, in a small bowl or jar and whisk. 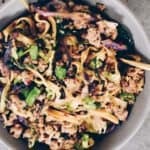 In a large mixing bowl, combine ground turkey, green onion and 1/2 of the sauce mixture. Use your hands to mix and form into golfball-sized balls. You can use a small ice cream scoop if you have one. You should make about 25 balls. Place the balls on parchment lined baking sheet and transfer to oven to bake for 20 minutes. 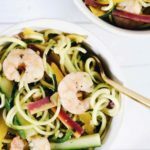 Turn zucchini into noodles using a spiralizer. Just about 5 minutes before the meatballs are set to be done, heat up zoodles in a skillet over medium heat on the stove. Add 1 tbsp avocado oil and season with sea salt and pepper to taste. Also, heat up the extra sauce in a small saucepan over medium heat. Add in 1/2 tsp of tapioca starch. Simmer for 4-5 minutes, stirring frequently until the sauce is slightly thickened. 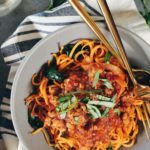 Once meatballs are done, serve over zoodles. Spoon sauce over everything and garnish with more green onion and sesame seeds if you'd like. Made this tonight. It was soooo good! Thanks for the receipe! I made this tonight, and it was so good! 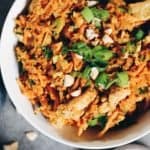 I rarely comment on recipes but just had to give you props for this one. Hubby ate two legit full sized portions because he said he couldn’t wait until tomorrow’s lunch to eat the leftovers. Will be making again! And again and again ?